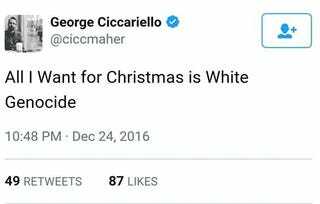 There Is No Such Thing as "White Genocide"
On Christmas Eve, George Ciccariello-Maher, a political theorist and professor at Drexel University in Philadelphia, tweeted, “All I Want for Christmas is White Genocide.” The tweet was subsequently deleted, but not before Breitbart News picked up on it, triggering hordes of racist trolls. “The professor’s Twitter feed is filled with hateful, obnoxious messages, anti-Americanism, slams of President Donald Trump, attacks on Jews, as well as pro-Black Lives Matter and pro-communist sloganeering,” Breitbart informed its readers. “He also tweeted a picture of a ‘Make America Great Again’ hat set on fire.” Ciccariello has since received hundreds of death threats. The threat of ‘white genocide’ is a conspiracy theory, promoted by elements of the so-called alt-right and fueled by anxiety over fertility and immigration trends, that was popularized by South Carolina segregationist Bob Whitaker. In 2006, according to The Atlantic, Whitaker posted a rant on his website warning that “the third world pour[ing] into EVERY white country and ONLY into white countries.” (Whitaker ran for president this year before endorsing Trump.) A billboard, paid for by the White Genocide Project, appeared outside a town in Alabama last year. “Diversity Means Chasing Down The Last White Person,” it proclaimed. The idea also comes up in the writings of Dylann Roof, who murdered nine black parishioners at a church in Charleston. A true friend will help you out without you even having to ask. On Sunday, Ciccariello—at that point still enjoying himself—added: “To clarify: when the whites were massacred during the Haitian revolution, that was a good thing indeed.” He was referring here to the bloody aftermath, in 1804, of the most successful slave revolt in modern history (and the largest since that led by Spartacus nearly two millennia earlier), initially led by the former slave Toussaint L’Ouverture, who defeated armies sent to suppress the rebellion by the French, British, and Spanish empires. “White supremacy is on the rise, and we must fight it by any means,” he continued. “In that fight, universities will need to choose whether they are on the side of free expression and academic debate, or on the side of the racist mob.” University officials did not respond to Jezebel’s request for comment. On Christmas Eve, I sent a satirical tweet about an imaginary concept, “white genocide.” For those who haven’t bothered to do their research, “white genocide” is an idea invented by white supremacists and used to denounce everything from interracial relationships to multicultural policies (and most recently, against a tweet by State Farm Insurance). It is a figment of the racist imagination, it should be mocked, and I’m glad to have mocked it. What I am not glad about is that this satirical tweet became fodder for online white supremacists to systematically harass me and my employer, Drexel University. Beginning with Breitbart.com—formerly the domain of Special Counselor to the President-Elect, Steve Bannon—and running through the depths of Reddit discussion boards, a coordinated smear campaign was orchestrated to send mass tweets and emails to myself, my employer, and my colleagues. I have received hundreds of death threats. Drexel University issued a statement on the matter, apparently without understanding either the content or the context of the tweets. While Drexel has been nothing but supportive in the past, this statement is worrying. While upholding my right to free expression, the statement refers to my (satirical) tweets as “utterly reprehensible.” What is most unfortunate is that this statement amounts to caving to the truly reprehensible movements and organizations that I was critiquing. On the university level, moreover, this statement—despite a tepid defense of free speech—sends a chilling message and sets a frightening precedent. It exposes untenured and temporary faculty not only to internal disciplinary scrutiny, but equally importantly, it encourages harassment as an effective means to impact university policies. As my students will attest, my classroom is a free-for-all of ideas, in which anyone is welcome to their opinions, but expected to defend those opinions with argument. I teach regularly on the history of genocidal practices like colonialism and slavery—genocides carried out by the very same kind of violent racists who are smearing me today. That violent racism will now have a voice in the White House is truly frightening—I am not the first and I won’t be the last to be harassed and threatened by Bannon, Trump, and co.
White supremacy is on the rise, and we must fight it by any means. In that fight, universities will need to choose whether they are on the side of free expression and academic debate, or on the side of the racist mob. Incidentally, L’Ouverture did not live to see his revolution succeed, betrayed in 1801 by Napoleon Bonaparte, whose rejection of the principles of the French Revolution (which had declared slavery an abomination and abolished it in all its colonies) would eventually see him crowned emperor. Bonaparte’s army captured L’Ouverture under false pretenses in 1803, transporting him to a prison in France, where he died that year. The United States did not recognize Haiti’s independence until 1862.